Journey’s End, director Sam Dibbs’ adaptation of R.C.Sherriff’s stage play, struggles to entrench itself in WWI. The umpteenth rendition of R.C.Sherriff’s racketing anti-war tension chamber belongs to director Saul Dibb, in a film that can’t quite recreate the overbearing sense of claustrophobia, nor the richly defined characterisation that earned Journey’s End its acclaim as a play. 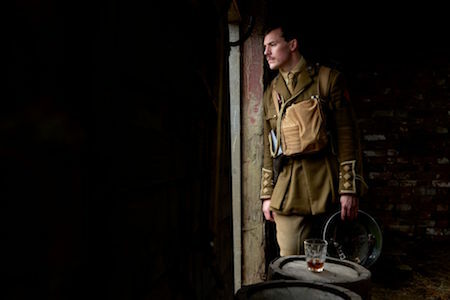 The narrative is now familiar to us, and writer Simon Reade rarely strays away from the source material, but for the sake of clarity: young-blooded Raleigh (played with competent eagerness by Asa Butterfield) joins a battalion of soldiers on the front line led by officer-and-drunkard Stanhope (Sam Claflin, who gives perhaps the best performance of his career). There they await their fate, where the threat of the ‘Bosch’ looms large. Much like DunkirkJourney’s End is entrenched in the futility of it all, substantiated by the tidbit of information given to us at the film’s close. There’s a clear sense of claustrophobia – which is to say, it is noticeable that Dibb, and more importantly, cinematographer Laurie Rose, are attempting to trap their characters within tight spaces, the camera pinning to each man as they wander the war-torn corridors that facilitate their dread. Their efforts aren’t entirely successful; without establishing shots of the open air or the vacant fields of Britain that await their return, there’s no contrast between interior and exterior, and so we never truly share our soldiers’ confinement. It doesn’t help that Dibb refuses to dwell on each scene, injecting the film with an urgency that contradicts Sherriff’s original intent. Raleigh, early on, remarks after his first day that ‘it feels like I’ve been here weeks’. Not to us it doesn’t. When the visuals do break free of their source material, it’s often to Journey’s End’s detriment. The raid that Osborne (an older officer warmly played by Paul Bettany) and Raleigh stage is depicted on screen. It’s fairly exciting, though the budget (or lack thereof) is noticeable. But wouldn’t the dread mustered up by waiting for the results of the raid, such as in the play, have worked better in both defining the soldiers’ sentiments and maintaining the claustrophobia? Rushing these moments in the dugout leaves little room for characterisation, and so each figure is reduced to broad British archetypes. On one hand, they could each act as microcosms for the British army as a whole – on the other, they feel written rather than lived, and so there’s a permanent detachment from the affairs of the film and the fates of each figure. A shame then, considering the general strength of the performances. Sam Claflin especially makes an impression as Stanhope – his bouts of fury and subdued sentimentality mark a career highlight for him. His character is given the most room to work with – Trotter (Stephen Graham), Raleigh and Osborne are relegated to cheery comic relief, innocent youth and avuncular figure respectively. Journey’s End has its heart in the right place, and the intentions of the film’s creators are laid bare for all to see. Unfortunately, it achieves little of what it sets out to do, misjudging how much can be handled between relaying the play’s overwhelming claustrophobia, and escaping its stagey roots. In the end, it manages neither. Journey’s End screens as the Headline Gala at the 61st BFI London Film Festival on 6, 7 and 14 October 2017. A beautifully lensed portrait of Mayan life under the Pacaya volcano, Jayro Bustamante’s Ixcanul exposes the terrifying vulnerability of indigenous peoples.